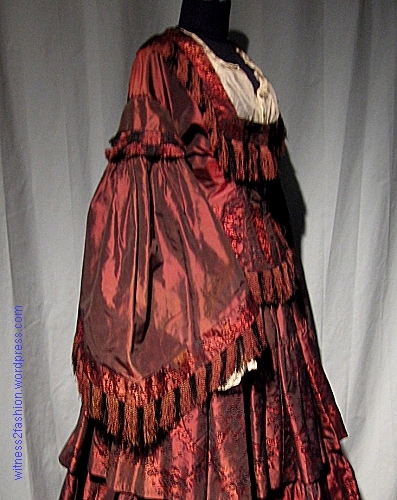 Victorian era flounced skirt and jacket, circa 1856. Private collection. This is close to accurate color, a dark cherry red. The fabric and fringe on this vintage outfit are really lovely, and the presence of what may be the original detachable inner sleeves and neckline fill made it memorable to me. The sheer tulle or netting used for the neckline and the sleeves was not ironed or cleaned for these quick photos. Bodice detail, black/ dark red changeable taffeta gown with black and dark red silk fringe. Circa 1856. Top button missing from white fill. 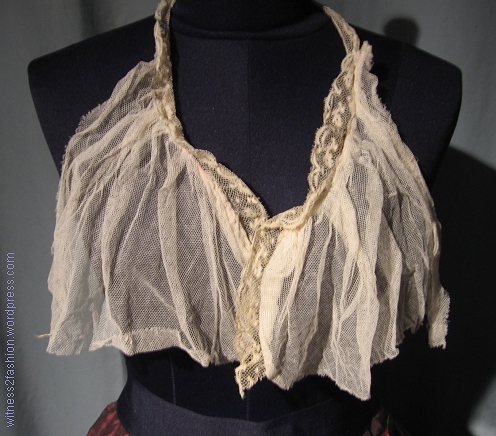 Netting and lace fill for the square neckline of the Victorian outfit. 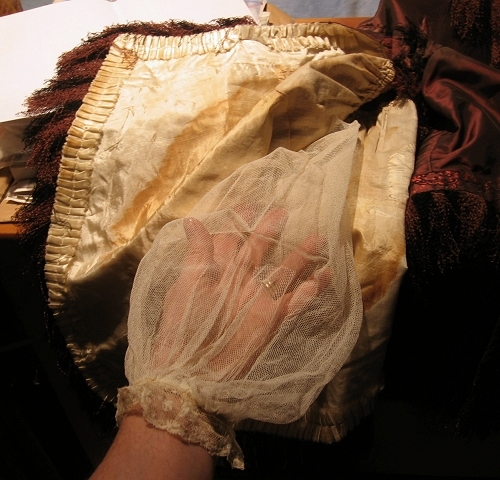 It would have been basted into place on the bodice, and removed for washing. It has a button placket down the center. Sadly, this outfit showed signs of being reconstructed: a modern grosgrain waistband on the skirt (visible in the photo above,) and small holes in the skirt where stitching was unpicked. Either the top flounce (and perhaps others) had been moved down to make the skirt longer, or the holes were left by the original cartridge-pleated waistline on the skirt, which may have been shorter in front than in back when it was made. The outfit also deserved a fuller crinoline to properly display the skirt, but these photos were purely for the purpose of inventory. Illustration from Le Bon Ton, January 1 edition, 1856. From the Casey Collection of fashion plates at LA County Public Library. 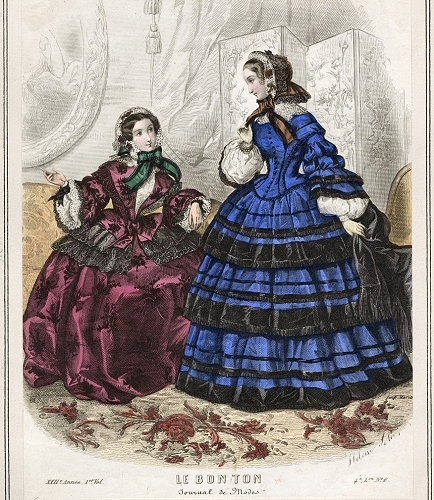 It’s possible that the top of the top flounce was originally hidden by the long, jacket-like bodice, as in the blue outfit above. (That’s a thin line of black ribbon trim on the flounce, not a seam.) The Casey Collection is a wonderful online resource, searchable by date. Click here to see more of it. The plates can be enlarged and magnified; the detail can be amazing. 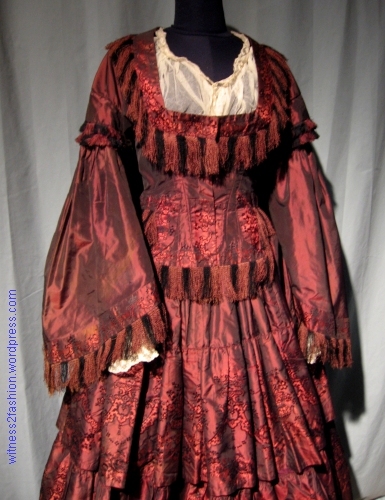 This gown, also from January 1856, is rather similar in color to the one I photographed. Our changeable taffeta two piece dress bears a slight resemblance to this sketch by Ingres of Mademoiselle Cecile Panckoucke, which the artist dated 1856. However, we should never suppose that women only wore dresses in the height of fashion, or that dresses based on fashion plates were made within weeks of publication, so “our” dress may be later. I photographed it as part of a private collection in the U.S. 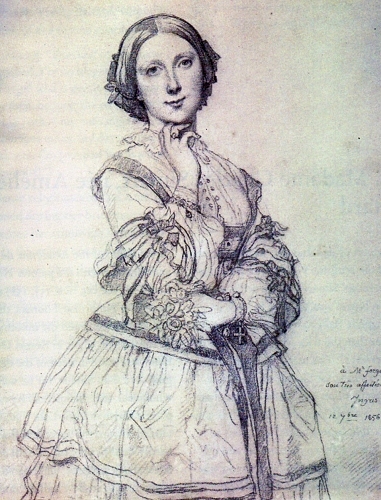 Portrait sketch of Mlle Cecile Panckoucke, Ingres, 1856. The painter Ingres sketched this dress, which seems to have a lower-cut jacket-like bodice, and signed his drawing in 1856. 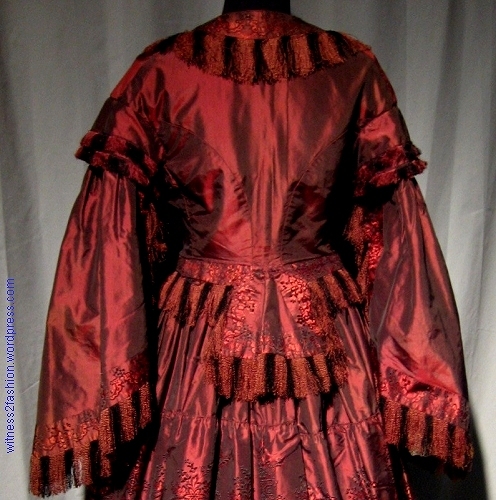 The “peplum” of the dark cherry-red and black changeable taffeta dress is shaped to have a squarish section below the waist in front and a smaller one in back, but not at the sides; the patterned trim and fringe continues all the way around the bodice bottom. 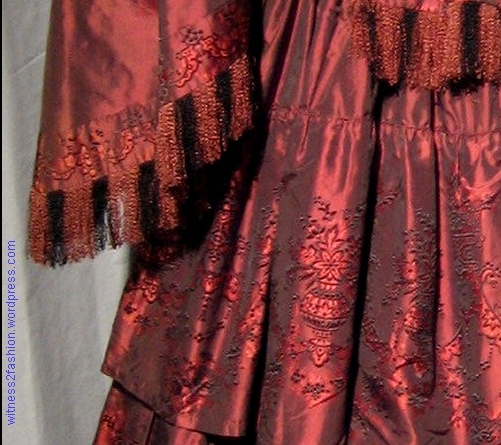 Front detail of bodice showing long, square front and black and red fringe trim. The fringe alternates red and black. The ground fabric for the dress is changeable taffeta, with the warp and the weft different colors: one is black and the other is dark cherry red. The flounces are the same mix, but have a jacquard pattern woven into them. Close-up of jacquard woven pattern in changeable taffeta. Probably 1850’s. Detail of the fabric’s woven pattern on flounce and sleeve trim. Photo enhanced. Strips of this patterned fabric trim the neckline and center front of the bodice, the bottoms of the sleeves, and the bottom of the bodice “peplum.” The trim may be the border of the fabric, not used on the flounces. Cherry and black changeable taffeta sleeves, trimmed with strips of a coordinating jacquard woven pattern. 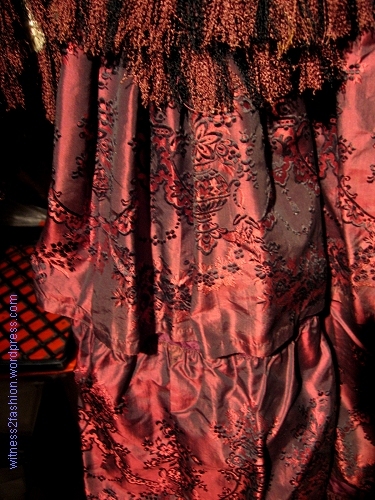 The sleeves are trimmed with two kinds of silk fringe, both alternating black and red. The fringe above the elbow, arranged in two layers for a checkerboard effect, is shorter and thicker than the fringe used elsewhere. It is also less “curly” in texture. 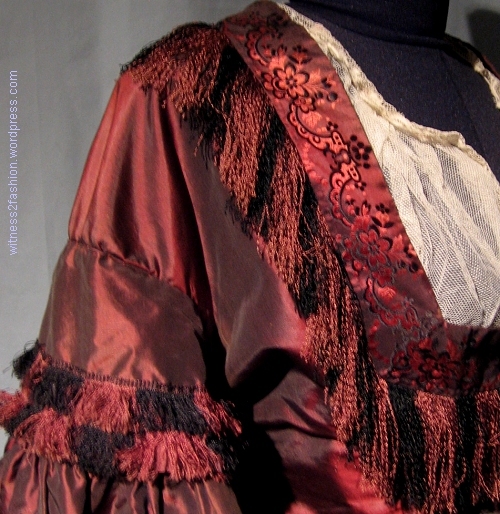 Detail of two kinds of fringe used on 1850’s changeable taffeta dress. Inside of pagoda sleeve, showing pleated trim on the lining. The inside of this sleeve was stained. You can see how sheer the detachable tulle inner sleeve is. I love the pleated detail on the lining, since the inside of a pagoda sleeve would be very visible when the wearer gestured, poured tea, etc. 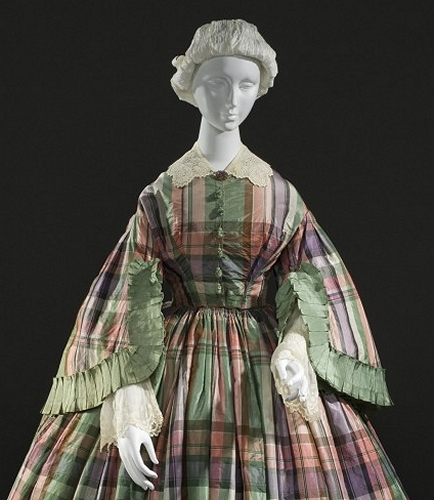 This 1855 pagoda-sleeved plaid dress is in the collection of the Los Angeles County Museum of Art. 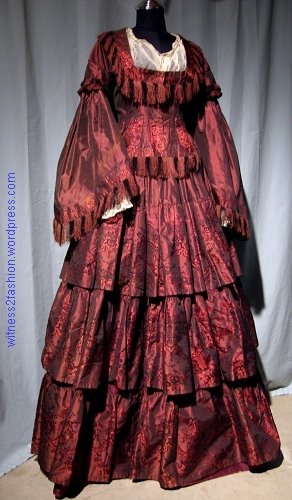 Pagoda sleeved dress, France, 1855. Image from LACMA digital archives. 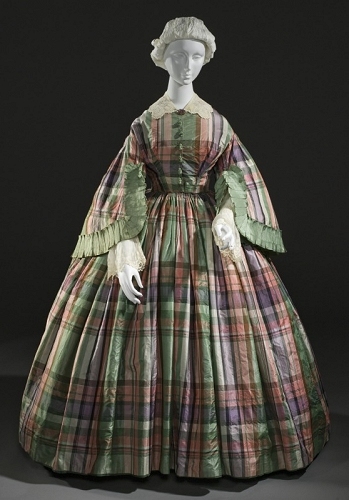 Plaid taffeta dress, France, 1855. Image from LACMA digital collection. Click here for more views of this dress; unfortunately, none shows the insides of the sleeves. The “buttons” on the front are actually small silk tassels. The use of coordinating fringe on silk dresses was not uncommon; I once rescued a fan-fronted bodice, entirely hand-stitched, from a Goodwill Halloween rack. The silk had “Granny Smith apple” green stripes on a cream background, accented with thin stripes of peacock (Prussian) blue. The pagoda sleeves were trimmed with a matching fringe, but it was purpose-made, not just the dress fabric with the weft unravelled, and the half-inch stripes in the fringe were mostly peacock blue and apple green. This portrait of Madame Moitessier in a fringed dress, also painted by Jean-August-Dominique Ingres, was finished in 1857. Detail of “Mme. Moitessier,” by J.-A.-D. Ingres, circa 1857. From Portraits by Ingres: Image of an Epoque. Her dress shows a Rococo revival patterned silk that became popular around 1855, according to Gary Tinterow, writing in Portraits by Ingres: Image of an Epoque, p. 440. Her dress is trimmed with silk fringe made from the same colors as the dress fabric, plus coordinating ribbons. 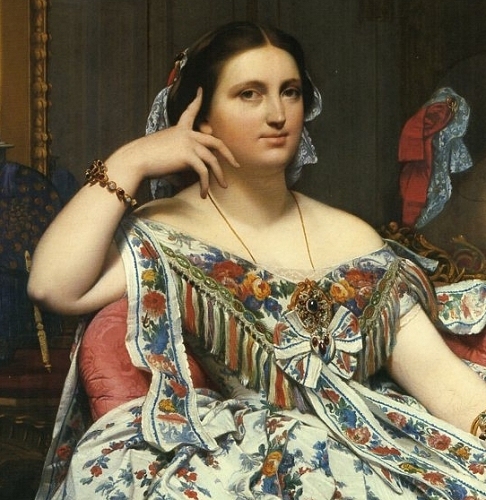 It took Ingres a famously long time to complete this portrait, first commissioned in 1844. Around 1847, Mme Moitessier’s little daughter Caroline was in the picture, leaning her head on her mother’s lap. It isn’t true that Caroline had to be painted out of the picture because she kept growing, although by the time Ingres was adding the final touches, in 1857, Caroline had grown up. (She was three in 1847, and nearly fourteen when the picture was finally completed!) In fact, Ingres made many changes as the portrait progressed. Caroline was too young to hold long poses (Ingres called her “impossible” [insupportable] and wiped her out early in the process.) In 1852, he asked Madame to wear her “yellow dress” to a posing session — not this dress, so he apparently made changes later, to be sure that the finished painting  showed her in an up-to-date fashion. 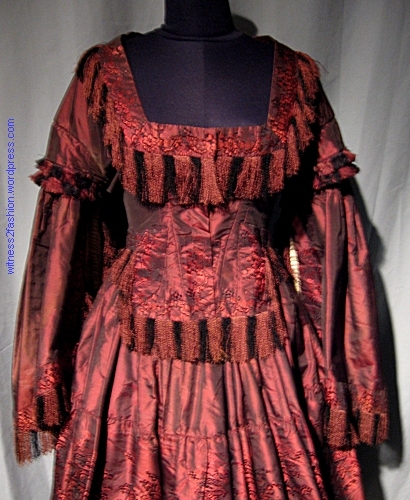 I wish I had taken interior photos of this dark cherry dress; I’m just glad I had these pictures to share. 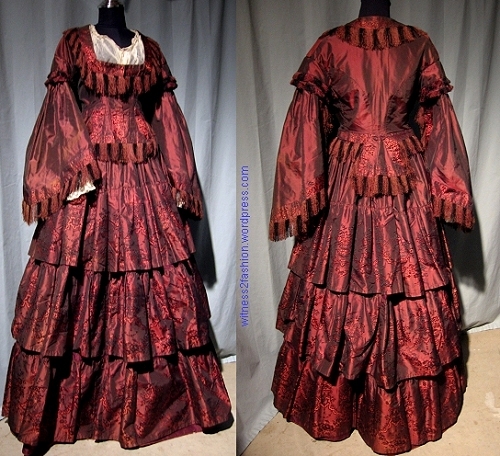 Front and back views of a dark cherry red changeable taffeta dress, circa 1856. Private collection. The color on the left is more accurate. NOTE: I did not examine this dress with a magnifying glass. Except for the stain in one sleeve, and the alterations to the skirt, it was in remarkably (almost suspiciously) good condition. Once I saw the alterations, I didn’t check for other machine stitching. I couldn’t ask the owner about it, so I can’t be sure if it is authentic, or a very elegant reproduction that fooled her, too. The dating is hypothetical and may be later than the 1850’s, for many reasons. Wherever this dress is now, a fabric test might be interesting. Expert advice is always appreciated! To see inside a brilliantly colored roller printed dress, Click here. For a details of a lightweight, plaid fan-fronted dress, Click here. For a bustle dress with beautiful buttons, Click here. And, for the much less beautiful lives of Victorian Working Women, click here.